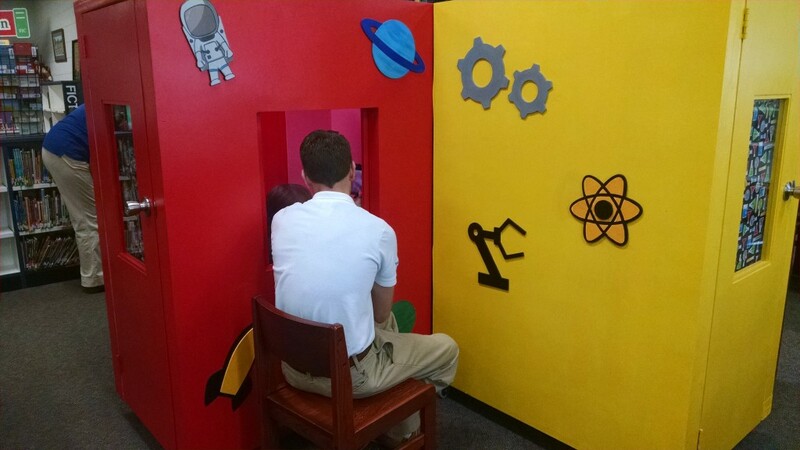 On December 1, 2015, a 3-D STEM exhibit, developed by a team of senior mechanical/aerospace engineering students from the University of Alabama in Huntsville (UAH), was unveiled for Greengate School. Greengate School serves as a dyslexia resource for the community and works to raise awareness of issues surrounding those with dyslexia. 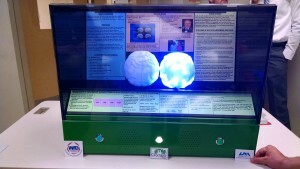 The exhibit is mobile, and when not on display in the school’s lobby, it will be used in conjunction with presentations the school makes on dyslexia education. Read more about the project here. 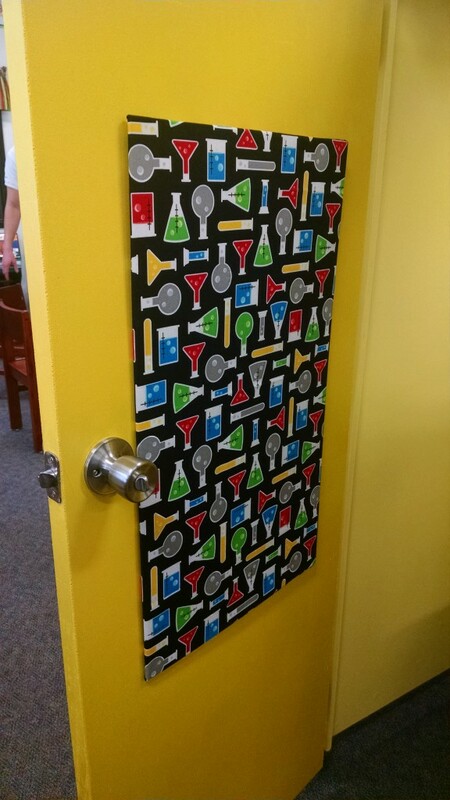 Upgraded STEM stations were unveiled at Mt. 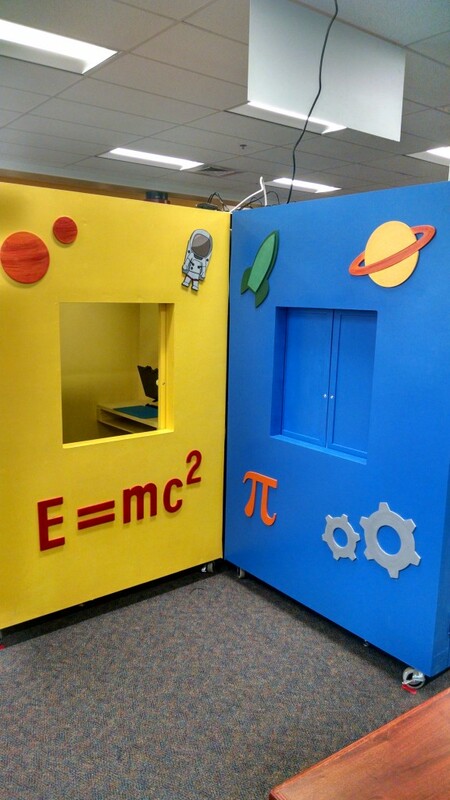 Carmel Elementary as part of their MakerSpace on Friday, November 20, 2015. It was a terrific success! Students were thrilled to use the stations again, with new upgrades implemented by the UAH volunteer engineering student design team, allowing stations to function better than ever before. The team is made up of six mechanical and aerospace engineering students Check out an article written by WAFF 48 News here. UAH Engineering Student Design Team with Dr. Christina Carmen (left), who teaches the design class where STEM projects are built; Ms. Debbie Fraley (middle), WID-TVC STEMi Director; and Ms. Cyndy Dunning (right), who serves as library media specialist at Mt. Carmel. 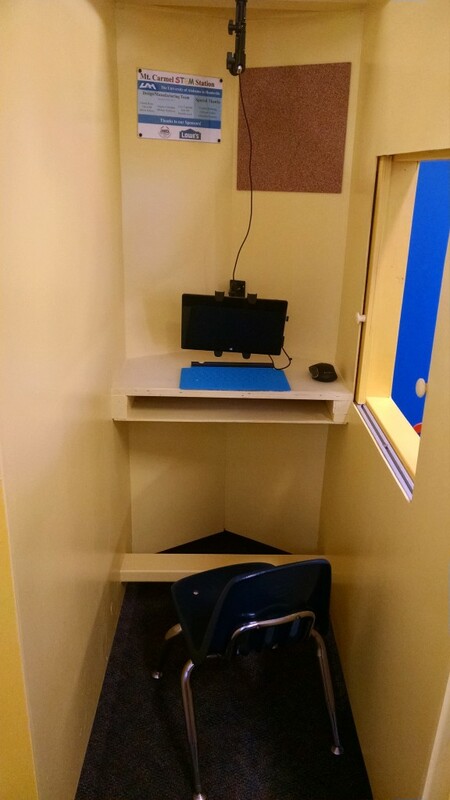 A look inside one of four pods where students do their work with a computer and video camera. 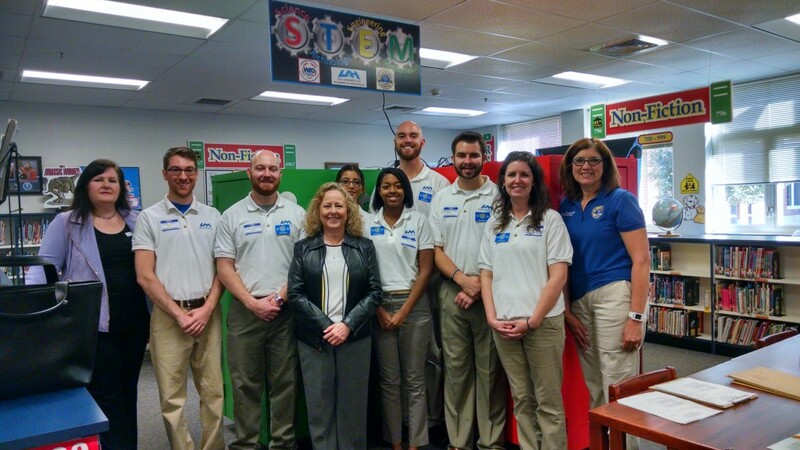 The Women in Defense Tennessee Valley Chapter STEM Committee reports that our senior UAH student design team who took on the mission this semester of finalizing the roller coaster system at Mt Carmel Elementary School has completed the task. It was daunting as the three roller coasters are outside in the central section of the school and embedded permanently in the ground, so they had to endure harsh cold weather to do physical changes, repairs, and upgrades over the last four months to bring them up to completion standards. 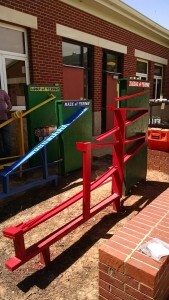 There are three roller coasters, each painted a primary color and named by the students themselves. The tracks are different lengths with varying obstacles and courses that the marbles must go through. 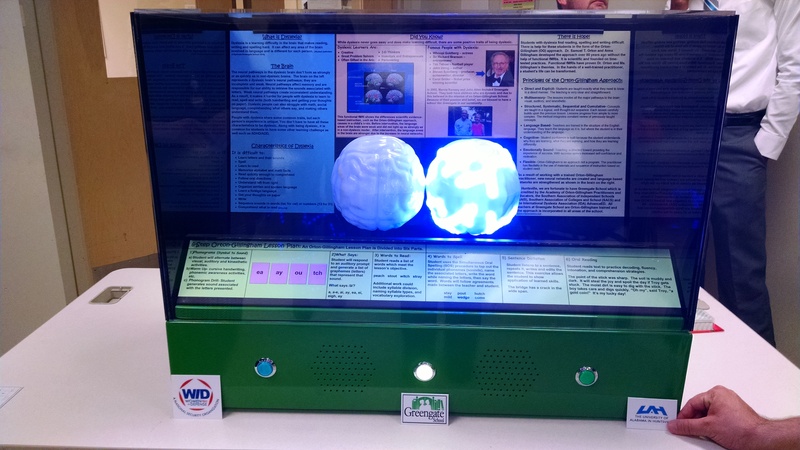 Each has a lift mechanism contained in an adjoining closed box panel where the students can interface with the system by turning a crank to make the lift mechanism move and drop a marble onto the track. (See attached photo.) 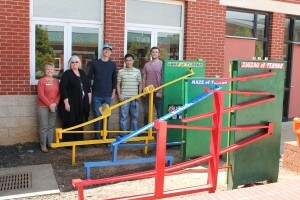 Our customer teacher, Ms Janet Vines, has expressed how happy she is with the roller coasters and the students who have been able to interface with them thus far are having a great time racing marbles. The section of ground where the roller coasters are located is bare right now, but the plan is to fill it in with mulch and pretty it up to become part of the large outdoor classroom that the school is creating. Other spaces within this outdoor area will include a fish and turtle pond, a sensory garden, a waterfall memorial area for students that have passed away while attending the school, and a small hemisphere shaped lecture area with stepped seating. The school has already video recorded students using the roller coasters and plans to post it on their school website.